I've got a great question from one of my readers: I have two central sites (primary data center and a disaster recovery data center) and I've inherited a situation where there was a lot of static routing and a default route pointing from the primary campus to the DRC. 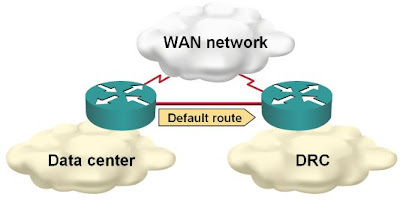 I've replaced most of the static routing with dynamic routing protocol, but as the documentation is scarce, I am afraid to remove the default static route (which I would need for proper Internet access). Is there a way to figure out whether the default route is still used? The deterministic one: inspect the IP routing tables on primary router and DRC router and identify any IP prefix on the DRC router that has no matching or less specific prefix on the primary router. This is where you can get really creative: how would you figure out if a packet going from the primary data center to the DRC site is using the default route? so, how many packets are going thru each one? Anybody's guess . . . .
Its a bit of a kludge, but if your route table isn't very big or dynamic you could create an access-list with permit statements matching your route table and a permit ip any any at the end, and check the numbers of matches. It would also allow you to log those packets to know where they're coming from or going. I realize I'm late to the game here being that it's almost November. And this is certainly not the quickest/easiest, but it may be the dirtiest with the most overkill with potential to offer a lot more insight into the network. How about slapping ntop on a linux box and enabling netflow on the interface? A quick glance at the source/destination pairs would show you if it's going to one of the DR subnets or elsewhere (assuming you don't have more than a dozen or so DR subnets). And once you've answered that question, enable netflow around the rest of the network and you've got yourself quite a resource for troubleshooting/forensics/etc. Of course if you don't have a spare linux box and/or aren't familiar with ntop, well, cef or the access-list thing sound good too.